The dashboard lights on your Honda Ridgeline are its way of communicating with you. Each light indicates some vital detail about your Ridgeline at any given time, keeping you informed about tire pressure, fuel levels and open windows. 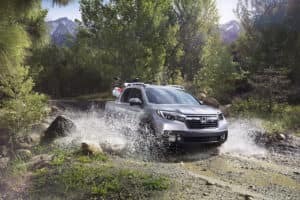 The Ridgeline’s dashboard lights also tell you about mechanical issues you can address yourself and those best left to an expert, such as the team at Norm Reeves Honda Huntington Beach. Familiarizing yourself with the layout of the Ridgeline’s dashboard lights helps you keep your ride in peak condition over a longer lifetime. Starting from left to right, here’s a brief rundown. The Brake System Indicator tells you when your parking brake is on or if it’s time to have your brake system checked out. The Low-Pressure Oil Indicator, shaped like an oil can, denotes a problem with oil pressure. You should have this looked at immediately. When your Ridgeline experiences a random malfunction, the engine-shaped Malfunction Indicator Lamp lights up. Have your Ridgeline examined at your earliest convenience. The Bed Lights Indicator tells you when your bed lights are on. If one of your back windows happens to be left open, then the Back Window Open Indicator light will come on. The battery-shaped Charging System Indicator means you should get your battery checked out. Accidentally leave your in-bed trunk open? The In-Bed Trunk-Open Indicator will tell you so. The Tire Pressure Monitoring System light tells you when your tires are under-inflated. It’s recommended you have them re-inflated as soon as possible. Vehicle Stability Assist Indicator alerts you to problems with the VSA. Please have this checked at your earliest convenience. If your lights and brights are activated, then the Lights and High Beam Indicators will tell you so. The A/T Temperature Indicator monitors the temperature of transmission fluid. Occasionally, you might need to have the sensors looked at. When your Honda Ridgeline is in traction control mode, then the VTM-4 lights up. But the VTM-4 staying lit for long periods sometimes indicates engine problems. Schedule service right away. An exclamation point light inside a bowl or a cup is the Honda Ridgeline’s Low Tire Pressure Indicator. Have your tire pressure adjusted immediately. It extends the life of your tires, creates better traction and handling, and won’t stress the powertrain or steering. The wrench shaped light is the Maintenance Minder Indicator, and it means it’s time to have your Honda Ridgeline serviced per its maintenance schedule. If your side airbag isn’t working correctly, then the Side Airbag Off light comes on. The key-shaped light is the Immobilizer System Indicator, letting you know the anti-theft immobilizer system is set. The Washer Level Indicator is shaped like a windshield with a wiper. It informs you when its time to refill your wiper fluid. If there’s an issue with an airbag, the Supplemental Restraint System Indicator will light up. It’s shaped like an airbag deploying in front of a person. Have this checked out right away. When you have cruise control turned on, the Cruise Control Indicator lights up. The Anti-Lock Brake System Indicator will light up when there is a problem with your Honda Ridgeline’s ABS. Because it pertains to safety, any ABS issues are best addressed promptly. You’ll know it’s time to refuel when the Low Fuel Indicator lights up. We are a Honda Superstore featuring an extensive service and parts department. Our online service appointment scheduler is available 24/7. Let our experienced team of Honda-Certified technicians take care of any issues or upkeep pertaining to your Honda Ridgeline.